Bulk validation has been available to our pilot users since June 2, 2017. In the end, this will be available to all our customers. 📌 Only users with the role of Accountant and SME Accountant have access to the validation overview. What can I do in the validation screen? In the validation overview, you will see all documents that are ready for booking. By applying the available columns and filters functions, you can get a better overview of the documents to be booked. By adjusting the columns and filters functions, you can choose what information you want to see in the validation screen. By clicking the function on the top right, you can select which columns you would like to see in the overview. A minimum of 9 columns can be selected. The status, total, relationship, and ledger columns are selected by default. The selected columns are saved on a browser level, not per user settings. This means that when you are logged in with the same user on the same computer and browser, the columns are saved. However, if you use another browser or log in to another computer, you will need to re-apply the columns. Documents can be sorted by using the available filters. The sorting functions are shown with arrows. You can sort your documents using one of the following columns: status, tag, journal type, invoice date, period, invoice number, total, relation, account code. For more information about the sorting of documents, click on this link. 📌 If you sort the column relation, it will also sort by creditor or debtor number. When you open the validation screen, the top invoice will automatically be opened. If you click another line, another invoice will be displayed. When the invoice is shown, a number of columns will be hidden. However, the booking details in these columns are visible under the invoice image (bottom right). Or you can minimize the invoice image by clicking on the arrow >> to view all the booking details. If an invoice has multiple posting rules, you can click the arrow on the right side of the line to make the other booking rules visible. In the first column of the validation overview you can see the status of a transaction. The status is shown by means of a color. You can sort to group the transactions with the same color and, for example, enable status green above. Green: All mandatory fields of the booking proposal are filled in. 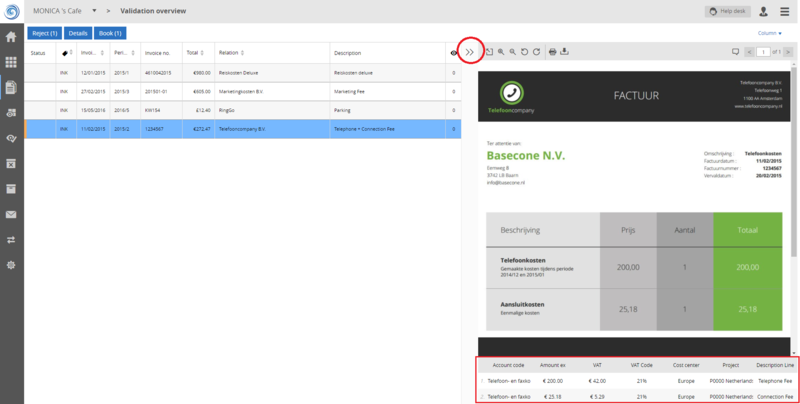 Basecone does some validations such as controlling if the booking is in balance and control if the invoice is a duplicate. Green means that there is no problem with these validations and is ready for booking. Orange: Not all mandatory fields of the booking proposal are filled in. It may also be that Basecone based on experience, thinks it is desirable that you check the transaction proposal before booking. Orange means that one of the above validations has detected a problem. Red: The accounting system is giving an error message. To use the bulk-booking feature optimally, it is crucial that the creditors and debtors' detail card are fully filled in for recognition and posting rules have been saved. In other words, make sure that the recognition of Basecone is used as well as possible. By selecting multiple documents, it is possible to book all the selected documents in one time. This can be done by holding down the Shift or Ctrl key, then you can select multiple documents. You can select a total of 10 documents and book at the same time by clicking the Book button at the top of the screen. If a particular creditor is always recognized correctly, then it may be useful to sort by relation. All invoices from this creditor can then be easily booked. If you have selected multiple documents for booking, Basecone will process all documents if possible. However, if the document cannot be booked, an error message will appear on the screen after you click book. Example: if the supplier/client is not selected, you will get an error message. If a document or invoice could not be booked, this will be shown with a red exclamation mark after the validation. If an error message appear in the validation overview, you can adjust the booking in the booking screen by clicking on the Details button, this will redirect you to the booking screen where you can manually adjust the booking details and then book it. Multiple documents can also be possible to rejected at once by pressing the shift key to select multiple documents. You can select a total of 5 documents and reject them at the same time by clicking the reject button.